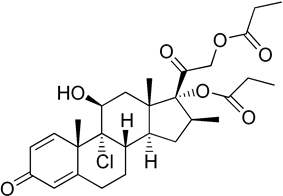 Beclometasone dipropionate (INN modified) or beclomethasone dipropionate (USAN, former BAN) is a potent glucocorticoid steroid. 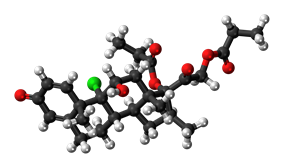 It is a prodrug of the free form, beclometasone (INN). In the form of an inhaler (e.g. Clenil, Qvar), a wide number of brands of which are available, it is used for the prophylaxis of asthma. As a nasal spray (e.g. Beconase, alanase, Vancenase) or nasal aerosol (e.g. Qnasl), it is used for the treatment of rhinitis (hay fever) and sinusitis). In some instances, it is used by oral pathologists in the treatment of unusually severe aphthous ulcers. As a cream or ointment (trade name Propaderm), it is used to treat severe inflammatory skin disorders (such as eczema) unresponsive to less potent steroids, but is generally avoided in the treatment of psoriasis due to the risk of rebound on withdrawal. It is also licensed to treat ulcerative colitis in conjunction with doses of 5-aminosalicylates in the United Kingdom in the form of a gastric acid-resistant, periodic-release tablet marketed under the brand name Clipper. It is on the health system. Occasionally, it may cause a cough upon inhalation. Deposition on the tongue and throat may promote oral candidiasis, which appears as a white coating, possibly with irritation. This may usually be prevented by rinsing the mouth with water after using the inhaler. Other side effects may rarely include: a smell similar to burning plastic, unpleasant taste, hoarseness or nasal congestion, pain or headache, and visual changes. Allergic reactions may occur, but rarely. ^ "WHO Model List of Essential Medicines" (PDF). Apps.WHO.int. ^ Willey R, Milne L, Crompton G, Grant I (1976). "Beclomethasone dipropionate aerosol and oropharyngeal candidiasis". Br J Dis Chest 70 (1): 32–8. ^ Salzman G, Pyszczynski D (1988). "Oropharyngeal candidiasis in patients treated with beclomethasone dipropionate delivered by metered-dose inhaler alone and with Aerochamber". J Allergy Clin Immunol 81 (2): 424–8. ^ Fukushima C, Matsuse H, Tomari S, Obase Y, Miyazaki Y, Shimoda T, Kohno S (2003). "Oral candidiasis associated with inhaled corticosteroid use: comparison of fluticasone and beclomethasone". Ann Allergy Asthma Immunol 90 (6): 646–51. ^ Haimovici R, Gragoudas ES, Duker JS, Sjaarda RN, Eliott D (October 1997). "Central serous chorioretinopathy associated with inhaled or intranasal corticosteroids". Ophthalmology 104 (10): 1653–60.